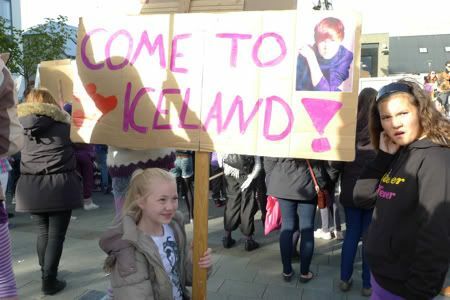 Justin Bieber, Come to Iceland! Three hundred tweens, flash mob style. This square was empty only minutes before! Now it was full of singing tweens, and what did they want? 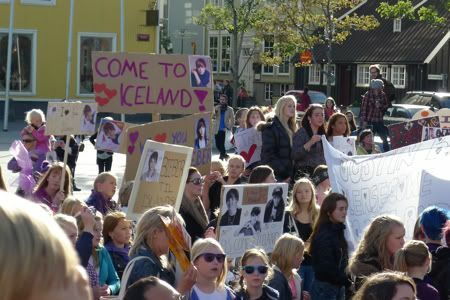 Justin Bieber to visit Iceland. At first I didn't understand what was going on, and thought perhaps Justin was in the crowd and it was a Beatles-style freakout. 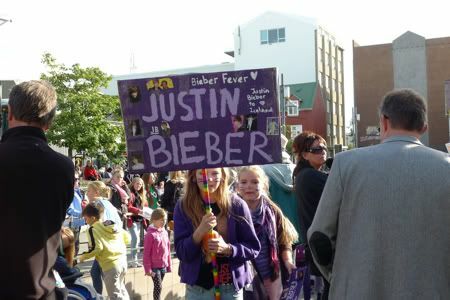 But no, this was a highly organized rally to bring him here for a concert. 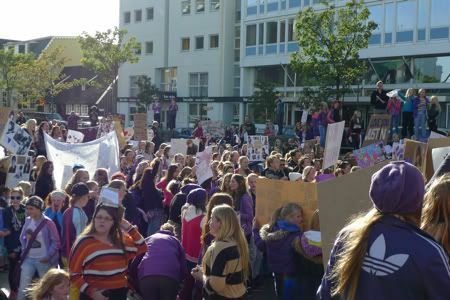 Icelandic tweens, I tip my hat to you. You clearly thought this out. 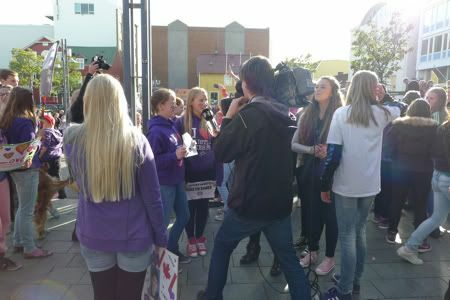 I love that there was not one but two news cameras covering this event. Oh, to live in a country where there is so little violence and crime that this probably makes the top of the news hour. 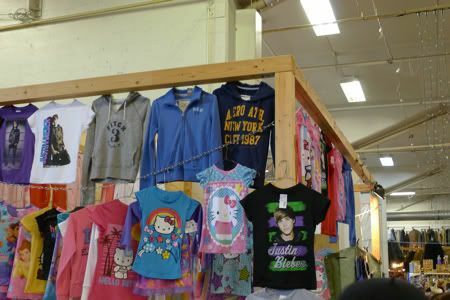 Julie realizes that she is wearing purple, Bieber's favorite color. She gets in the spirit. I get into the spirit too! The number of Bieber songs playing on the loud speakers that I recognized actually surprised me (ok, scared me). How is that possible? They don't even play his songs on Top 40 radio, do they? Yet somehow they've seeped into my subconscious. "Never say never... Shorty is an eenie, meenie, miny, mo lover... There's going to be one less lonely girl." Did I just ruin all my indie cred there? I don't know how this happened, I swear. It was all pretty cute. Look at this little moppet. Her friend is rightly skeptical of us. Non-tween intruders! 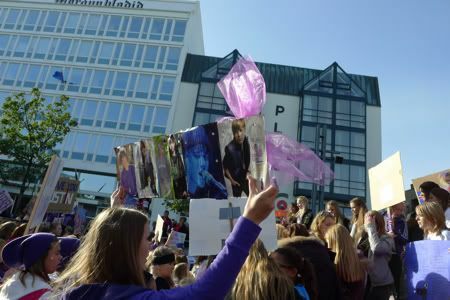 After this experience, I noticed Bieber's angelic face plastered on merchandise all over Iceland. He is popular. Justin, dear, if you are out there reading this, get on your private jet and fly to Iceland. It's the least you can do! You have some loyal, loyal fans there. You could probably take over the country if you wanted to. 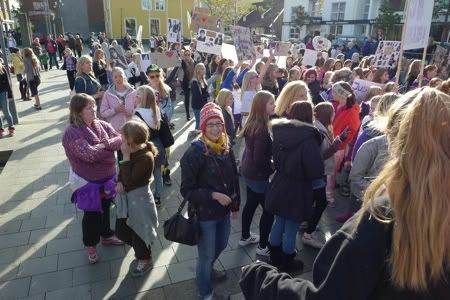 OK, if you have any interest left in Icelandic Bieber, you need to watch the short video I made of the rally! So you can get the full effect. 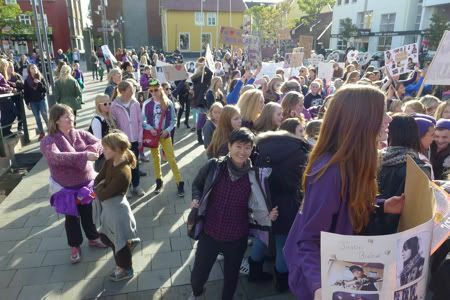 Icelandic tweens are too cute. 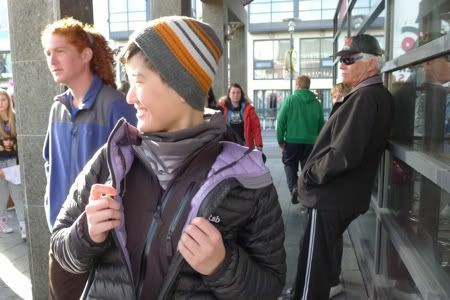 Posted in Travels and tagged with Justin Bieber, Iceland. September 27, 2011 by Adele Chapin.